Natalya Abutkova was born on April 26, 1916, in the village Verhodvore of Kirovsk region (Russia). 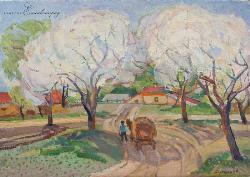 In 1951 the painter graduated from Kyiv State Art Institute. Her teachers were A. Shovkunenko and T. Yablonska. In 1972 Abutkova became a member of National Artists’ Union of Ukraine.